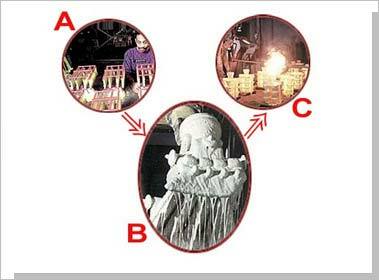 This process is commonly known as the lost wax casting process. It got its name because of the fact that ancient Egyptians used it to make gold jewelry hence the name Investment. Very intricate shapes with high accuracy can be made in this process. Additionally metals which are hard to machine or fabricate can be cast with this process. Parts that cannot be produced otherwise by normal manufacturing processes like turbine blades with complex shapes, or airplane parts that needs to withstand high temperatures are examples of this process. (C) Finally knockout, cutoff and finishing processes. The process works like this first a mold is made by making a pattern. Wax or some other materials can be used that can be melted away. The wax pattern is dipped in refractory slurry, which coats the wax pattern and a skin is subsequently formed. It is then dried. The process of dipping in the slurry and drying is continued till a firm thickness is achieved. The pattern is placed in an oven and the wax melted. This leads to a mold which can be easily filled with the molten metal. The wax pattern can be made by a duplicating process using a stereo lithography or a similar model that has been fabricated by a computerized solid model master. The slurry materials used are a mixture of plaster of Paris, a binder and, a refractory material. Powdered silica is used for low temperature melts. For higher temperature melts, an alumina-silicate is used as the refractory material. While silica is used as a binder. Additional coatings of sillimanite and ethyl silicate may be applied to increase the quality of the finished product.. The mold thus produced is ready for use as light castings. It may be reinforced by placing it in a bigger container and adding more slurry. Before the pouring operation, the mold is pre-heated at about 1000ºC (1832ºF) to remove traces of wax. Pouring can be done in gravity, pressure or vacuum conditions. Mold permeability factor is to be kept in mind when using pressure, to allow the air to escape as the pouring is made. Tolerances of 0.5 % of length are possible, and for small dimensions it can be as low as 0.15%. Parts do not require machining because of the closer tolerances. Typically materials that can be cast with this process are Aluminum alloys, Bronzes, Stainless steels, Stellite etc. Glass mold accessory castings, Valves and fittings, Gears, Levers and Splines are some of the popular usages. Time consuming process and costly. Exceptional surface finish possible but minute lacuna can cause rejection of castings as a result scrap rates can be high. Follow instructions carefully and seek the advice of investment casting experts. Start with a reasonable size casting. Bigger projects are harder and can take longer periods. For example Ring or jewelry-sized castings can be made easily with Investment casting process. Start early:The process takes a long time, and castings don’t always come out easily that is the reason for starting early.